Santoña Teens Surf Camp take place in our 1,500 m² surf-hostel & surf school on the beachfront of Berria, in Santoña, Cantabria, Spain. The beach of Berria is one of the best beaches in the north of Spain for surfing. It is much more than a surf camp, we offer a lot of parallel activities so that participants enjoy and live an experience they will never forget. Promoting and teaching surfing in the Eastern Coast of Cantabria (North of Spain) since 1994. Santoña Teens Surf Camp is formed by a young and dynamic team that has as a common passion the love of surfing. More than 5000 participants have already enjoyed our Surf Camp and their full satisfaction is our best guarantee. The constancy and variety of Berria Beach waves allow both beginners and experienced surfers to enjoy incredible surf sessions, and the proximity of some of the best spots in the country makes this place even more attractive. In Santoña is also what is surely the longest wave in Spain, although it is not easy to break when you do it allows you to enjoy a journey of more than 1km in length. In addition, the surf camp is located within the natural reserve of the marshes of Santoña and the Joyel and only 15 meters from the beach. You will learn to surf in the safest way, all our instructors are certified and the minors will be supervised 24 hours a day. Our surf camp has become a benchmark in the north of Spain and this is because what worries us the most is its full satisfaction. COME TO ENJOY THE BEST SURF AND THE HIGHEST FUN OUR SANTONA TEENS SURF CAMP. WE ARE WAITING FOR YOU! The accommodation has a capacity for 75 people and we separate participants from surf camps by gender and age, you will sleep on the beach listening to the waves in a unique environment. A dining room located in the same facility, so we will not have to travel at lunchtime. A screening room where we will watch surf movies and we will also make video corrections of your surf sessions. The diet of the participants is healthy and varied and we take into account the possible allergies and needs of the clients. You will only have to inform us and we will adapt the diet to your needs. All of our surf camps for children include full board (breakfast, lunch, snack and dinner). We are proud of our facilities, cleanliness, and organization. ARE YOU GOING TO LOSE IT? WE ARE WAITING FOR YOU! Our main activity is based on surfing, we have been perfecting our teaching method for years and our objective is the total independence of our students at the end of the surf camp. All our monitors are experienced, we take great care of our selection since we are aware of the importance of this aspect. We segment our participants from the surf courses by levels and ages. Surf courses range from water sessions to knowledge of the environment: We will study the currents, the functioning of the waves, meteorology, interpretation of the parts, winds, etc. As well as everything related to safety in the water. At the end of the surf camp our students will be able to surf the waves and be totally autonomous in the water. The beach of Berria is perfect both for those who are starting in the world of surfing as for the more experienced, depending on the tide point Berria beach offers long and maneuverable waves both right and left, when the tide is low and the funds placed you can find good barrels that will delight the most experienced. It is a very constant beach since it collects swells from the north, northwest that are predominant in this area of northern Spain. Initiation to Stand Up Paddle. Our accommodation is located on the beach in a spectacular setting and belongs to the nature reserve of the Santoña, Noja and Joyel marshes. We are only 50 km from Santander and 75 km from Bilbao. There are many low-cost flights that fly to Santander or Bilbao. The connections to these cities are from London the main Spanish cities, also sometimes there are direct connections to Santander or Bilbao. 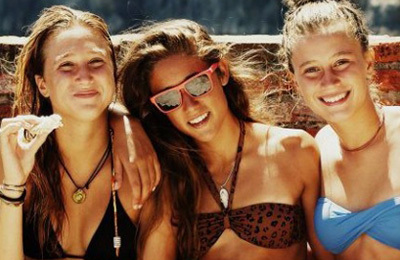 Once you land, you can reach the surf camp on your own or with the transfer service offered by Santoña Teens Surf Camp, which can pick you up from the airport/bus or the train station of Santander or Bilbao. Accommodation in shared rooms for two, three, four, six and eight people. All rooms have a bathroom and shower. Surf lessons, 2 hours a day + 2 hours of free surfing in the evenings, under the supervision of our instructors. 24-hour surveillance by free time monitors. Longskate at your disposal during the stay. Screening of surf movies and videos.